Here's another update to a story previously (and repeatedly) covered here: the Missouri Supreme Court is considering whether the Kansas City Royals can be held liable because its lion-like mascot, Sluggerrr, threw a hot dog into somebody's eye. Goofy as the facts are, the court's decision may set an important precedent. John Coomer says he was enjoying a game in 2009 when Sluggerrr, who had at least put down the air cannon sometimes used for this purpose (seen in this frankly somewhat disturbing image) and was tossing them by hand, somehow managed to toss a hot dog behind his back and into Coomer's eye with enough force to detach a retina. See "Dog-Flinging Mascot Blamed for Eye Injury," Lowering the Bar (Feb. 24, 2010). The Royals moved for summary judgment based on the "assumption-of-risk doctrine," which in the baseball context means that, for example, a fan hit by a foul ball can't sue because that risk is inherent in the game. The court denied the motion because it found that even if hot-dog flinging had become a customary part of the game, as the Royals argued, there was an issue of fact as to whether Sluggerrr flung negligently. See "Court: Baseball Fan Did Not Assume Risk Associated With Hot Dog Toss" (Feb. 10, 2010). For whatever reason, that particular Sluggerrr did not return after the 2009 season, and reports said the new incarnation would receive more comprehensive training at a "mascot boot camp" run by the guy who was the original "Phillie Phanatic." See "New Royals Mascot Reportedly Training to Avoid Further Incidents"(Feb. 26, 2010). The case went to trial, and in March 2011 a jury that had been instructed on assumption of risk found in favor of the team. On appeal, the plaintiff argued that instruction should not have been given, and the Missouri Court of Appeals agreed with him. See "Bad News for Dog-Flinging Mascots" (Jan. 16, 2013) (noting court's holding that the doctrine did not apply because "the risk of being hit in the face by a hot dog is not a well-known incidental risk of attending a baseball game"). The Royals appealed. So that's how a case involving a guy in a freaky-anthropomorphic-lion suit throwing hot dogs at people got to the Missouri Supreme Court. That court heard oral argument on September 11 (the briefs and an mp3 of the argument are available here). The Royals, though, phrase the question as whether "the risk of being struck by a thrown hotdog is an inherent risk of the Hotdog Toss" (emphasis added), which they say has become "an integral part" of a Royals baseball game. Their brief notes that the "Hotdog Toss" has occurred at every one of the 800 home games the Royals have played since 2000 and that fans have come to "love and expect" it. 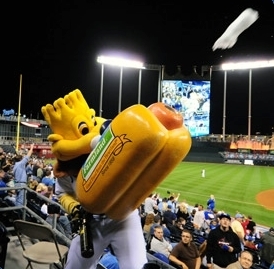 Considering that from 1995 to 2012 the Royals had exactly one winning season, it is not too hard to believe that the "Hotdog Toss" did become very important to their fans. But is it—and are other potentially risky things that teams and their mascots do—really "integral"? I personally think the Missouri Supreme Court is going to affirm, ruling in the plaintiff's favor on the grounds that at least these kinds of mascot antics are not an inherent part of the sport. This would mean the case would be sent back for another trial in which the jury would not be instructed on the doctrine. It's one thing to say the doctrine protects a sport, because like most sports, baseball has a detailed set of rules. (The exception of course is soccer, where people just run around and kick at things, as far as I can tell.) The existence of those rules make it more likely that a court will be able to tell if necessary what is and isn't an inherent part of the activity. But I'm pretty sure there is no mascot rulebook, so that these cases would be pretty fact-intensive and so more suited for a jury. This wouldn't mean mascots must go, just that juries would have to determine whether they were negligent based on particular facts. It might mean that teams would decide to get rid of things like mascot-fired air cannons rather than take the liability risk, but you know what? That would not be the end of the world.